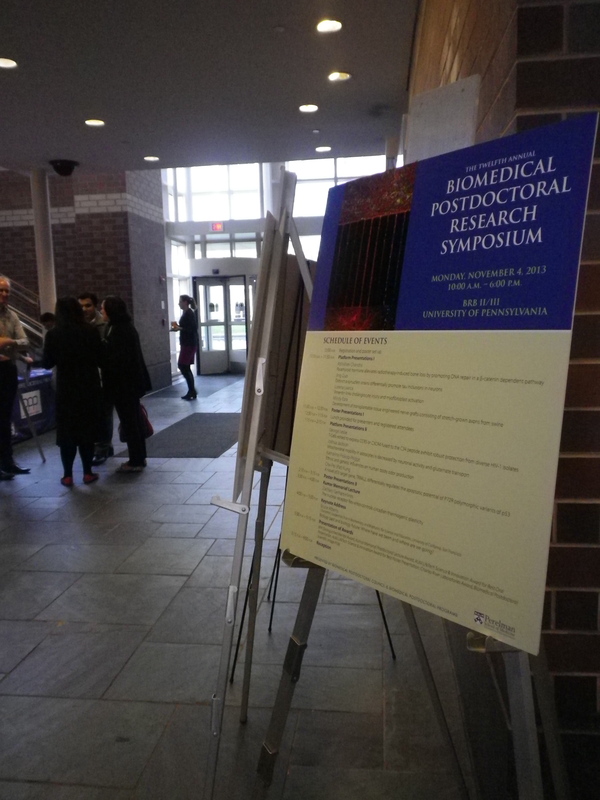 -Liisa Hantsoo covers the Biomedical Postdoc Symposium, an exciting full day of biomed postdoc research. -Rosie Mott presents part two in her series looking at teaching as a postdoc. 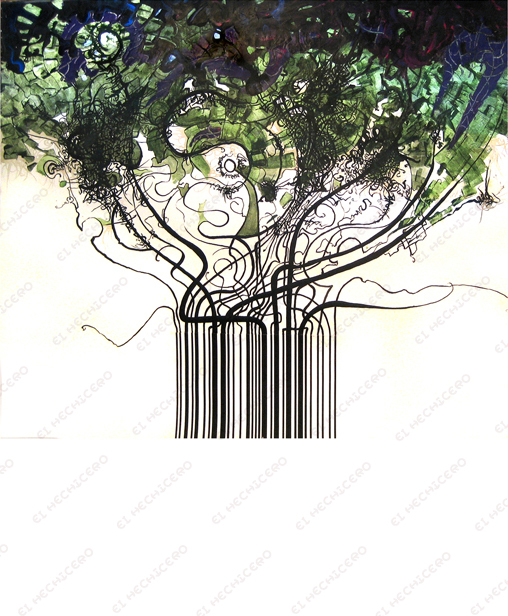 -Maria Chacon gives important info on how labs can be more environmentally friendly. 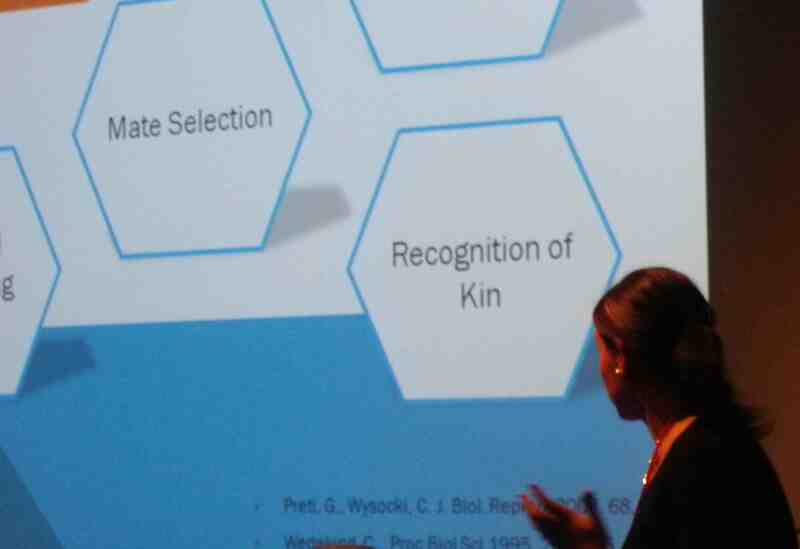 -Reteeka Sud writes about the complex topics addressed by the Penn Science Policy Group. 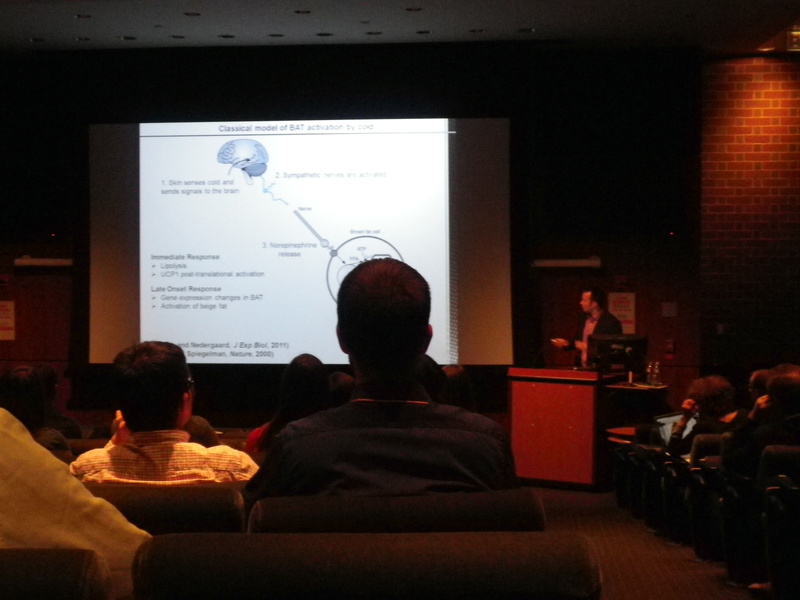 November fourth saw the fruition of a year of planning, the research efforts of over eighty Penn postdocs, and over three hundred attendees at the Annual Biomedical Postdoctoral Research Symposium. Adam Walker, Chair of the Biomedical Postdoctoral Council (BPC) Symposium Committee that organized the event, was enthusiastic about this year’s Symposium. 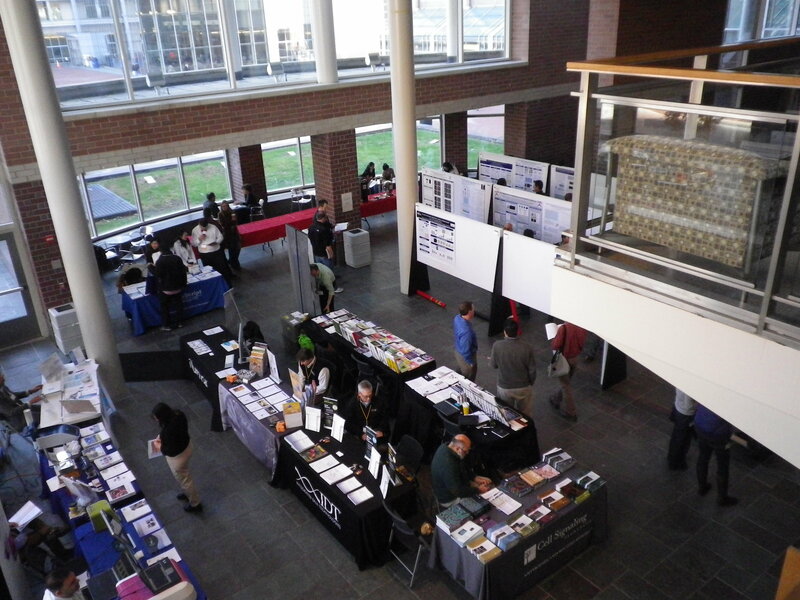 “Organizing the symposium was a lot of work, but seeing it all come together on the day made it well worth the effort.” The Symposium included research from postdocs enrolled in the Biomedical Postdoctoral Program across eight different institutions; most were from the School of Medicine, representing over 25 departments. Research topics were diverse, ranging from transplantable tissue-engineered nerve grafts to genetic influences on human body odor. The event was a full-day affair, starting with a series of platform presentations in the morning. This was followed by a poster session, and lunch that enabled networking. The afternoon included more oral presentations and a second poster session, and was capped with the Kumar Memorial Lecture and a keynote address by Dr. Bruce Alberts. 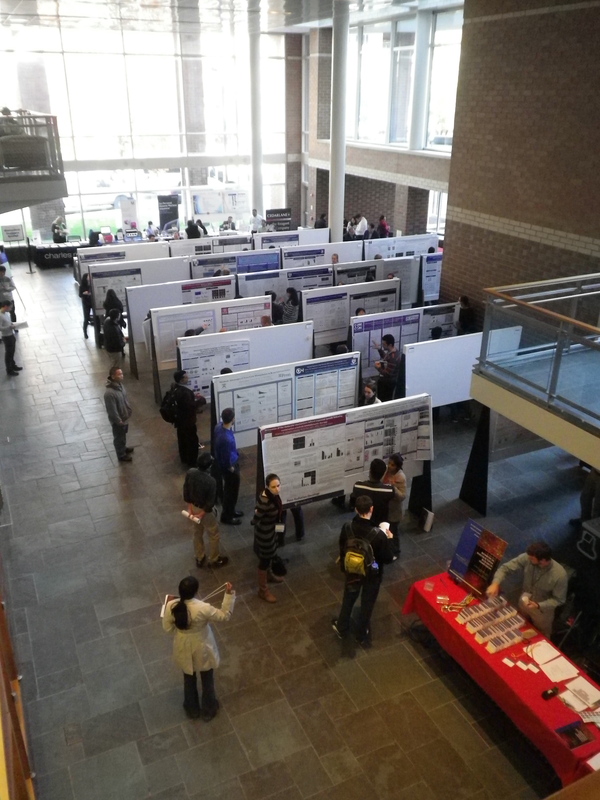 Awards were presented, and postdocs and faculty ended the day with a reception. The Kumar Memorial Lecture. Photo Credit: Liisa Hantsoo. One of the highlights of the day, The Kumar Memorial Lecture is dedicated to Dr. Sanjeev Kumar, who was a Postdoctoral Fellow in the Department of Pathology and Laboratory Medicine at Penn. Dr. Kumar was passionate about research, and about communicating science to others. He also “thrived on the collegial collaborations and scientific discussions fostered by the research environment at Penn,” and the Kumar Memorial Lecture is selected based on that spirit of research pursued by Dr. Kumar. This year’s presenter was Zachary Gerhart-Hines, a postdoc in the School of Medicine’s Division of Endocrinology, Diabetes, and Metabolism. Gerhart-Hines presented research that he recently published in Nature with faculty member Mitchell Lazar, M.D., Ph.D., on the transcriptional repressor Rev-erb alpha’s circadian regulation of brown adipose tissue function. 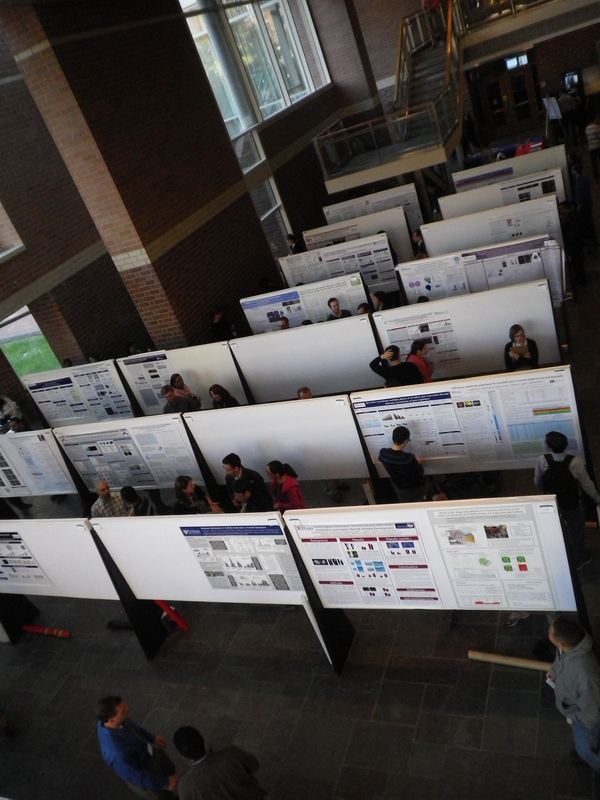 Postdocs present their research at the symposium poster sessions. Photo Credits: Liisa Hantsoo. Postdoc Joshua Jackson, Ph.D., presents his research in a platform presentation. Photo Credit: Liisa Hantsoo. Katharine Prokop-Prigge, Ph.D., gives a platform presentation. Photo Credit: Liisa Hantsoo. 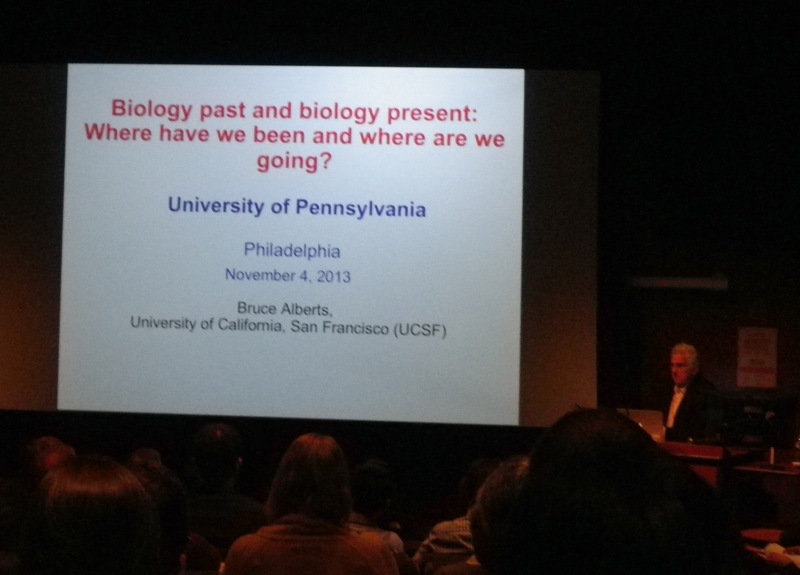 The Symposium keynote speaker, Dr. Bruce Alberts, is a prominent biochemist and Chancellor’s Leadership Chair in Biochemistry and Biophysics for Science and Education at UCSF. He has served as Editor-in-Chief of Science and as President of the National Academy of Sciences. He is also recognizable as an original co-author of the classic textbook The Molecular Biology of the Cell, which many postdocs may have on their bookshelves from their undergraduate cell biology courses. His lecture focused on science education and the idea of “science for all,” making science accessible to those beyond academia. He also gave a few gems of advice from his own research career, noting that scientists are wise to learn from their failures, reading widely across the literature is a smart move, and that having a good strategy is the key to scientific success. Keynote speech by Dr. Bruce Alberts. Photo Credit: Liisa Hantsoo. “Having Dr. Alberts attend, and for him to be so enthusiastic about our work, was a great honor. 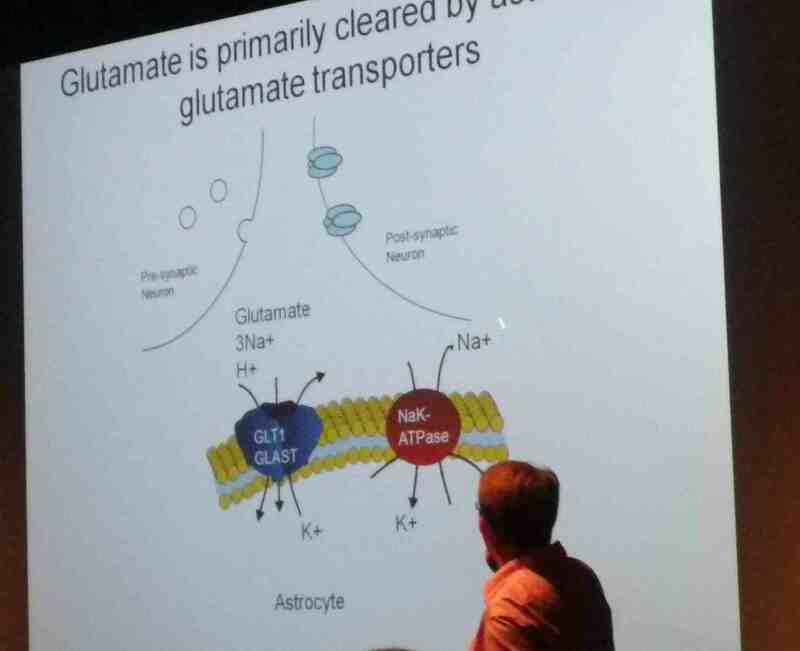 And it was inspiring to meet someone who has been a name in biochemistry who most of us would have known from early undergraduate times,” said Symposium Chair Adam Walker. Charlotte Hiu-Yan Chung, a member of the Committee who hosted Dr. Alberts during his day at Penn, expressed that “he was such an inspiration and a fun person to talk to. You can tell he’s truly enthusiastic in science education and genuinely interested in learning about our research. He gave great input to everyone.” Walker appreciated that Dr. Alberts’s talk acknowledged the “plight of postdocs in the modern biomedical sciences, given how rapidly our work environment, expectations and opportunities have changed over recent years.” Walker noted that Dr. Alberts encouraged advocacy work for the future of scientific research. The winner of the Biomedical Postdoctoral Scientific Image Prize, by Dr. Charlotte Hiu-Yan Chung. Photo Credit: Charlotte Hiu-Yan Chung. Vendors provide information on scientific products. Photo Credit: Liisa Hantsoo. 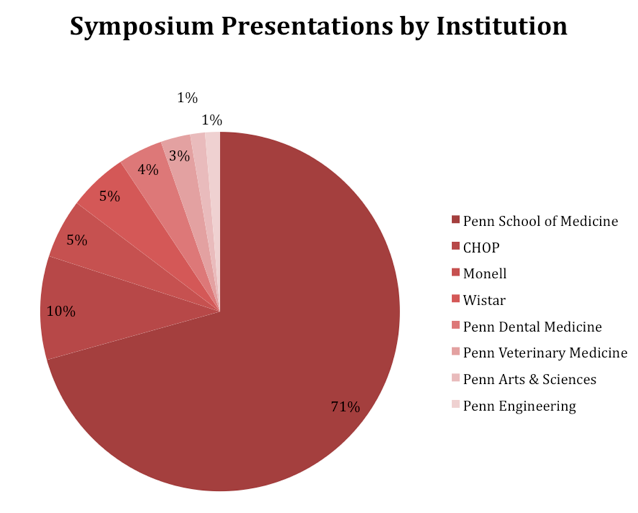 Following the Symposium, the committee went to work soliciting feedback from the Penn community. Based on survey results, attendees’ favorite part of the symposium was the keynote lecture by Bruce Alberts. Attendees also cited the opportunities to network, hear about fellow postdocs’ research in fields to which they would not normally be exposed, and to gain experience in presenting, as positive aspects of the Symposium. Image courtesy of Deviantart.com. Image Credit: “Gene Code” / Hechiceroo. * About six months ago, the US Supreme Court ruled unanimously against a Utah-based company, Myriad Genetics, that they could not patent genes that confer increased susceptibility to breast and ovarian cancers. In this case, the central argument was whether “isolating” or “extracting” genes qualifies for patent protection. For everyone who wished for the public to have access to these diagnostic tests without having to take out a second mortgage on the house, this was great news! * Six Italian scientists were among seven convicted for manslaughter in October 2012, for failing to give adequate warning for an earthquake three years earlier that killed more than 300 people. In this case, the key to the dispute was the kind of cautious language scientists typically use in predicting highly uncertain events. The larger issue here is the misunderstanding that scientific risk assessment is the same as prediction – it is not! Even for those of us not working in the field of seismology, this verdict was a big shocker. It does not take much to imagine the implications such a verdict might have to your own area of research. Well-known examples include the purported link between vaccines and autism; whether climate change is real and if it is affected by human activities; and the forever favorite – theory of evolution. The sentiments underlying such contentious issues can be summed up in this quote from one of the civil party (in the Italian lawsuit mentioned above) – “either they didn’t know certain things, which is a problem, or they didn’t know how to communicate what they did know, which is also a problem.” The latter half of the quote points to a gaping chasm between scientific community and the general public. Scientists find themselves at a loss of words on “how best to put it” when the subject at hand is filled with uncertainties, and their audience expects definitive answers. “Miscommunication” doesn’t seem a strong enough word to reflect this gigantic issue with world-wide implications, that lead either to public indifference, or at its worst, mistrust of the scientists by the public at large. This conundrum is part of the reason that the Penn Science Policy group (PSPG) came into being. The idea for the group was conceived about a year ago by 4th year graduate student, Mike Allegrezza. Currently the President of the group, he explains his vision for PSPG: “the goal of PSPG is to inform and engage researchers in ways that science interacts with society.” Though advocacy is a prominent theme among their activities in the last year, it does not confine their scope. “It is critically important to connect the general public to scientific research, which includes reminding people of the great scientific and medical achievements that have improved our lives, explaining the latest discoveries to them, and discussing exciting and tangible possibilities in the future that could be realized through science. These are things that both domestic and international researchers can do to increase public’s understanding of and support for science”, he said in an interview for this article. Last summer, PSPG, along with Penn’s Office of Govt. Affairs, coordinated visits for Pennsylvania Congress members to tour research labs at Penn and speak with researchers. The chief objective was for policymakers to get firsthand look at the ‘ground realities’ of budget sequestrations. PSPG also compiled research abstracts that were sent to members of Congress to show them how federal grants are being put to good use across diverse fields at Penn. These tracks are part of their continued efforts to protect NIH funding for Penn labs. Another parallel stream of PSPG activities constitutes preparing Penn researchers to communicate with elected representatives, and with the general public. Adam Katz of ‘Research! America’ was invited to campus to speak with Penn researchers about “how (and why) to engage congress as a research scientist”. Research! America is a non-profit organization working to make research a higher national priority. During his talk, Mr. Katz informed the audience that even though members of public agree that research should be a priority, they do not have a clear understanding of how research is funded. In a poll conducted by Research! America, only a small percentage of voters identified NIH as the main source of funding for basic biomedical research. As one of the audience at this talk, this was a stark revelation to me. As scientists, it is part of our responsibility to rectify this error. The message would be different, or at least differently worded when you are talking to, say, a staffer from Rep. Chaka Fatah’s (D-PA) office, on why it is necessary to keep the pressure up on Congress so as to not further jeopardize research funding. It’s a different conversation than when someone casually asks “so what do you do in lab”, where the point is to inform members of public on “what” you do, and surely “why” that information is important to know. Nonetheless, it is our responsibility to inform and engage members of public. On a related theme, PSPG also organized a talk by Dr. Paul Offit, the Chief of Division of Infectious Diseases at CHOP, and author of several books including his latest “Do you believe in magic? The sense and nonsense of alternative medicine”. Dr. Offit led a discussion on how scientists can combat misinformation. Highlights of the discussion included widely held misconceptions around dietary supplements. He recommended scientists use evidence-based science when communicating on subjects like this. In my experience on the subject, I find it healthy to remind yourself you are dealing with people’s beliefs (they believe taking multivitamin pills is good for them), so it is wise to limit the “matter-of-fact attitude” and make an attempt to connect with their emotions at the same time. PSPG have also invited speakers to provide information on careers in science policy. Prominent examples included Dr. Richard Calderone from Georgetown University. A microbiologist with an active lab, Dr. Calderone also advises lawmakers on public health issues, and has started a Master’s program in Science Policy & Advocacy at Georgetown. Information about upcoming activities of the group is sent on email listserv, and also posted on the group’s website (http://pennsciencepolicy.blogspot.com). Postdoctoral fellows are welcome to attend all PSPG events. “I have empty pipette trays coming out my ears – what can I do with them?” “Can I really find freecycled lab items in Ben’s Attic?” “Where can I recycle these batteries?” Penn’s Green Labs program has great solutions for all of these concerns. Green Labs is part of the Green Campus Partnership, the umbrella organization that was formed in 2007 to address environmental sustainability planning and policy development at the University of Pennsylvania. The Green Campus Partnership emphasizes shared responsibility between the institution and the individual, and works to coordinate programs and initiatives for a more sustainable campus, Fulfilling the Climate Action Plan established in 2009 to reduce the campus’ greenhouse gas emissions requires the power of this partnership to build a culture of sustainability and to reduce Penn’s carbon footprint. As part of this strategy for a more sustainable campus, Penn started a Green Labs Program to provide overall guidelines for lab greening. The first step in this program was creating a Green Labs @ Penn guide which begins with general guidelines and suggestions for how to improve sustainability in your lab. It includes a summary checklist with all actions listed in the guide, to help you choose the appropriate actions for your lab. The subsequent five sections, Energy Conservation, Water Conservation, Waste Reduction, Purchasing, and Green Office, provide more detailed information about how to complete their corresponding actions. The guide ends with a list of further resources that you may find helpful. Throughout the guide you can find additional information on parallel initiatives outside of Penn, such as smart plugs, ENERGY STAR and Labs21, and the Penn Green Fund that offer additional resources for your lab. 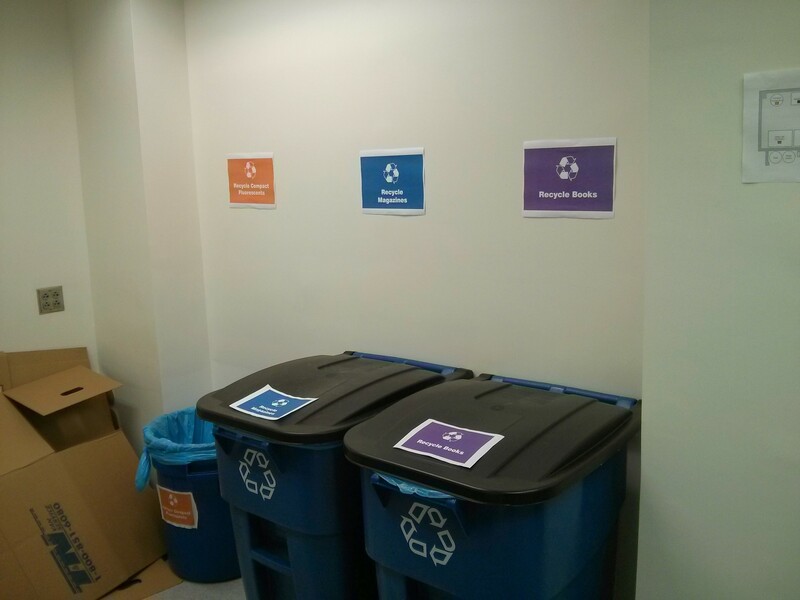 In addition to the Green Labs at Penn Program, a new comprehensive recycling room has been set up in the second floor of Clinical Research Building (CRB; 415 Curie Blvd.) in the former mailroom. This room is a single location to recycle batteries, phones, toner cartridges, pens, hardcover books, softcover books, paper, and single stream materials. 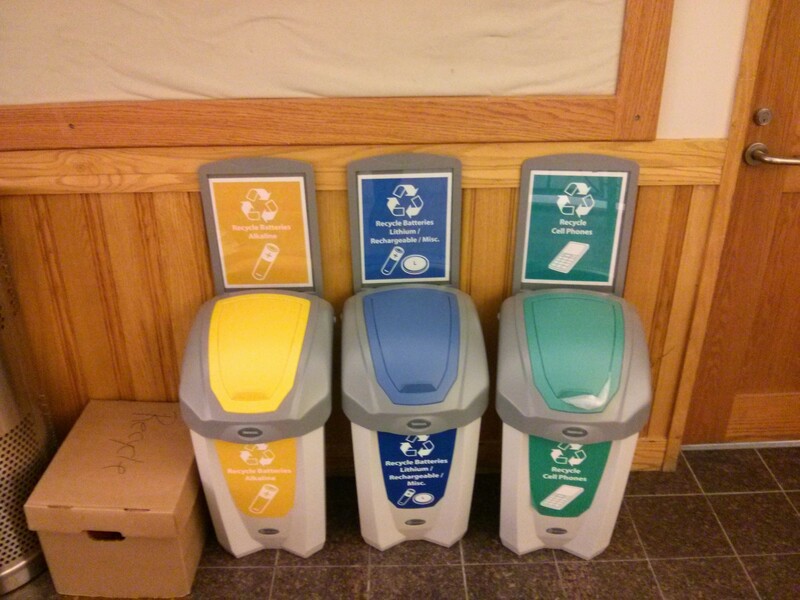 Head over to the CRB to drop off your recyclables, and check out the links below for more information on how to make your lab a greener place. The new recycling room in CRB. All Photo Credits: Maria Chacon. 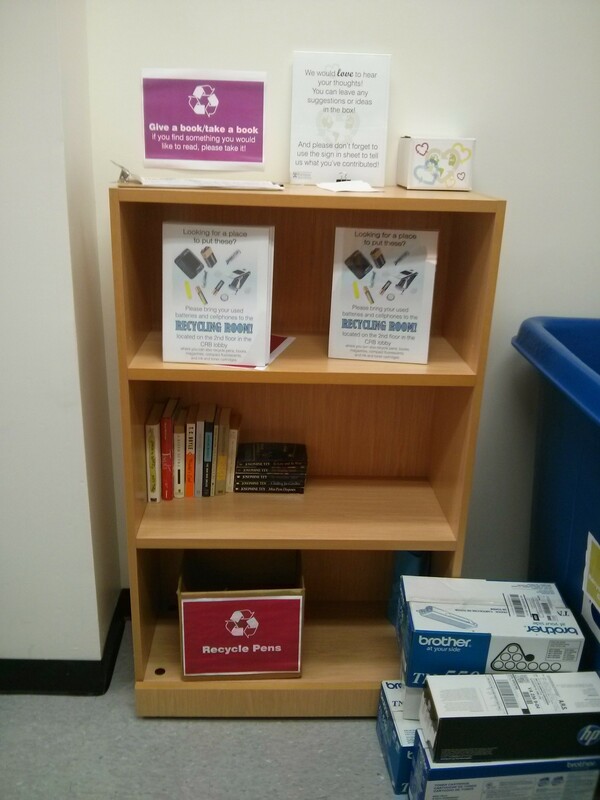 Recycling Room at CRB 2nd Floor, 451 Curie Blvd. 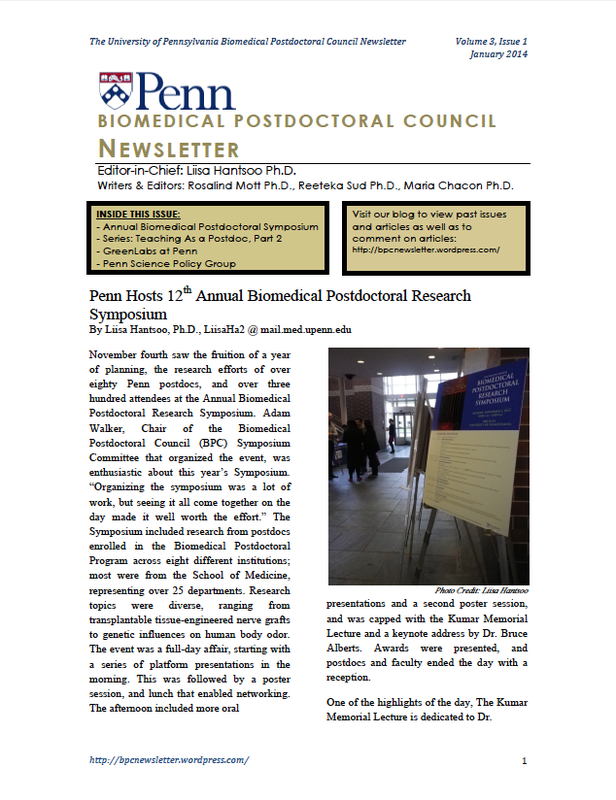 In the fall edition of the BPC Newsletter, we reported on opportunities at Penn for cultivating one’s teaching skills. For this edition, I took some time to meet up with Marybeth Gasman, Ph.D. at the Graduate School of Education to discuss some of the more complex issues in university-level teaching. An accomplished scholar, Dr. Gasman has written or edited fifteen books, many of which focus on diversity in education and minority serving institutions. She lends her expertise to Penn-PORT (Penn Postdoctoral Opportunities in Research and Training) by serving as the co-director with Yvonne Paterson, Ph.D. as director. 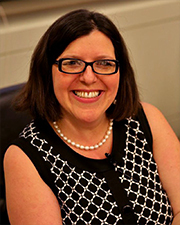 Marybeth Gasman, Ph.D., Co-Director of PennPORT. Image courtesy of University of Pennsylvania Graduate School of Education. Participants put their new skills into practice during their second year of the program in which they teach an introductory biology course and then a special seminar, which they design themselves. The truth is that reaching a level of award-winning teaching while doing cutting-edge research is not an easy goal. It is best to recognize early where your best talents lie and pursue the right path. For the teaching-savvy, a program like Penn-PORT will give you an edge. Over two-thirds of the IRACDA post-docs land academic jobs . Notably, many of these jobs are at teaching-focused universities. A major challenge on the research end is the lack of animal facilities at these schools, so finding an alternative model is critical for continuing research. On the flipside, faculty at teaching universities discover great rewards in blending their research with teaching initiatives as they recruit enthusiastic undergraduates to work in their labs. If you have a teaching experience that you would like to share with other postdocs, please contact me via email (rmott-at-seas.upenn.edu). We’ll continue the series on pedagogy with your personal accounts and a survey of the experiences of the typical Penn postdoc. Price, Michael. “Teaching Postdocs to Be Professors.” Science Careers: MySciNet, 26 Oct. 2012.